North Korea is encouraging “localization” of raw materials in light industry and construction from this year to improve the lives of the North Korean people. On January 7, RodongSinmun reported that various cabinet organizations were espousing the New Year’s address of Kim Jong Un. It reported that the Ministry of Light Industry’s executives and employees are engaging in discussions to explore ways to increase localization of raw materials in light industry factories. A rally was held in Pyongyang earlier this month at Kim Il Sung Square where people pledged to accomplish the national tasks put forward by Kim Jong Un. Tong Jong Ho, Minister of Construction and Building-Materials Industry,delivered a speech that vowed to “make an unprecedented leap in localization of building materials (cement, glass, metals, and other construction materials),” by repairing building materials factories in all provinces. North Korea is promoting light industry and construction as the key sectors to improve the living standards of the people and asserting localization of raw materials as a priority to make advancements in these fields. In his New Year message, Kim Jong Un emphasized that lighting industry must play a “major part in improving the people’s standard of living” and that the construction sector is “an important front for solidifying the foundations of a thriving country and creating bases for the people’s happy life.” He called for modernization of factories in light industry and normalization of production, placing importance on increasing the proportion of locally-available raw materials. Many experts analyze this year’s rising emphasis on the localization of raw materials as reflecting the intentions of the North Korean authorities to focus on pragmatically achievable policy goals first. Of course, increasing the proportion of locally-available raw materials requires the construction of domestic production base, which remains complicated because of international sanctions and lack of foreign currency — issues that cannot be easily resolved– among other limitations. 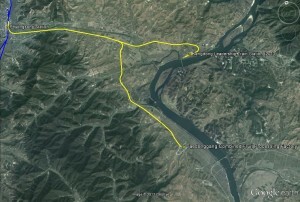 Pictured above (Google Earth): The new Taedonggang Fruit Processing Factory Railway Line (in yellow). I previously blogged about this railway line here. On August 31, KCNA announced “Railway line of Taedonggang Combined Fruit Processing Factory goes operational” and that the opening ceremony was attended by staff from the Ministry of People’s Security (MPS) and Korean People’s Internal Security Forces (KPISF). The KPISF is part of the MPS. The presence of so many security personnel might seem odd for the opening of a railway line that is intended to provide fruit products to North Korean consumers. However, because this very same railway line connects the Kim family compound in Kangdong with the city of Phyongsong by rail (See above map), the heavy security presence seems understandable. This railway line will be heavily watched. The interesting (and speculative) takeaway is that it might be the case that security for the Kim family is now under the portfolio of the KPISF and not the State Security Department (SSD, Ministry of State Security, anjon-bowibu), KPA, or Military Security Command. To learn more about the North Korean security services, check out: Coercion, Control, Surveillance, and Punishment: An Examination of the North Korean Police State by Ken E. Gause. Pyongyang, August 31 (KCNA) — A new railway line branching into the Taedonggang Combined Fruit Processing Factory went operational with due ceremony on Friday. The operation of the railway line helps satisfactorily carry fruits and processed goods produced by the Taedonggang Combined Fruit Farm and factories in this area and materials necessary for their management and operation. Present at the ceremony were officials of the Ministry of People’s Security, servicepersons of the Korean People’s Internal Security Forces, officials concerned, builders and employees of the factory. At the end of the ceremony the first train carrying fruits to be supplied to Pyongyang citizens left the factory. In last month’s New Year’s Joint Editorial, North Korean authorities reaffirmed the national drive to strongly develop the country’s light industrial sector by 2012, the 100th anniversary of the birth of Kim Il Sung. On February 2, the Choson Sinbo, the newspaper of the pro-North Korean residents’ league in Japan, proclaimed that all efforts were being focused on delivering high-quality light industrial goods by April of next year. North Korea’s minister of light industry, forty-seven year old Hu Chul San, was interviewed by the paper’s Kook Jang Eun. Hu stated that light industrial zones already in operation would be further bolstered and the provision of raw materials would be prioritized for celebrations surrounding the 100-year birthday of the country’s founder. The North Korean regime has set 2012 as the year in which it will “open the doors to a great and prosperous nation,” and Kim Il Sung’s April 15 birthdate has been set as the first target for economic revival. Just as in 2010, this year’s Joint Editorial called for light industrial growth and improvements in the lives of the North Korean people as the ‘strong and prosperous nation’ goal is pursued. The minister also explained that all preparations for distributing light industrial goods to the people next April needed to be completed by the end of this year, since Kim Il Sung’s birthday fell so early in the spring. He stated that a strong base had already been established for the production of high-quality goods, and that many organizations had already mass-produced high-quality goods for the celebration of the 65th anniversary of the Korean Workers’ Party founding last year, offering the Pyongyang Sock Factory, the Sinuiju Textile Mill, the Botong River Shoe Factory, and the Pyongyang Textile Mill as examples. When asked how North Korea would resolve raw material shortages, the minister explained that since the February 8 Vinalon Complex began operations last year, Vinalon and several other types of synthetic materials were available. The Sunchon Chemical Complex and other industries were also providing synthetic materials to light industrial factories throughout the country, strongly supporting indigenous efforts to increase production. He added, “Raw rubber, fuel and other materials absent from our country must be imported,” but that “national policies were being implemented” to ensure steady supply. Minister Hu admitted that there was no shortage of difficulties, but that every worker was aware of the importance of meeting the April deadline, and that because raw material shortages were being resolved, light industries were now able to press ahead with full-speed production. You are currently browsing the archives for the Ministry of Light Industry category.